We may change this policy from time to time, and if we do we will provide notice on this site regarding any changes to this policy. The information we collect may also include information you submit about others, including the name, e-mail address or physical address of a gift recipient. We only use information you submit about other people to deliver information, products, or services specifically requested by you or to cooperate with law enforcement officials in the investigation of alleged unlawful activities of our customers. The information we have obtained through this process may be used by GolfShoesOnly.com, as well as by providers of related services, in connection with processing your order. We also use contact information from the registration format to send the User information about us and when otherwise necessary. Such information may also be used to assess your satisfaction with and to obtain feedback regarding the Service we provide and to tailor the visitor's experience while visiting our site. We may use the contact information we collect to provide, by means other than email, information or offers which we believe will be of value to Users and their employees and we may share contact information with other companies that may want to provide our Users, by means other than email, information regarding additional products and services. We may also use the contact information to send our Users information or offers by email which we believe will be of value to them and we may share email contact information with other companies that may want to provide our Users or their employees information regarding additional products and services. Such contact information may be shared based upon the demographic information we collect. Users may opt-out of receiving future communications at any time; see the section below regarding "Opt-out". Your use of the Service constitutes your consent to the use of such data on an aggregated basis. This Site is, generally, directed at persons over the age of 13 who purchase items with credit cards and we do not knowingly collect personal information from or about children under the age of 13 except as relating to a specific order for products or services. If we, at any time, learn that information relating to a child under the age of 13 that we have obtained is other than as set forth above, we shall immediately purge such information from our records. Like most other sites, The GolfShoesOnly.com servers may automatically track certain information about activity on our site. This information allows us to keep our site running efficiently. This information may include: the browser being used (such as Netscape, Internet Explorer, etc. ); your operating system (such as Macintosh, Windows XP, etc. ); your IP address; and the referring URL and all company URL's you visit. We use your IP address to help diagnose problems with our server, and to administer our site, but your IP address is not connected to information that is personally identifiable. 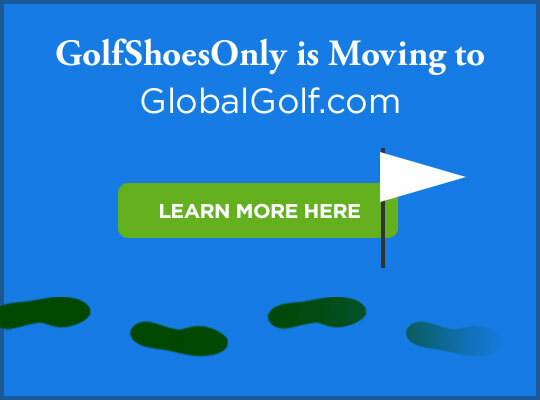 In addition, GolfShoesOnly.com may use "cookies" on certain pages of our site to automatically collect information from a visitor to our site and transfer this information to the visitor's hard drive. Cookies help us recognize repeat visitors, allowing communication of a personalized welcome message and tailoring of content to match particular interests. Given the government's current interest in Internet regulation, you hereby authorize us to disclose information pursuant to judicial and administrative proceedings, and in connection with law enforcement activities and as otherwise may be permitted by law, to law enforcement or government agencies if we believe the disclosure is necessary or appropriate. You also authorize us to disclose information if we believe the disclosure is necessary or appropriate in the event of an investigation of improper or illegal conduct in connection with our site, such as fraud, misrepresentation, intellectual-property infringement, or other activity that may put us at risk for liability. We will, whenever we believe reasonably possible, use our reasonable efforts to inform a User whose information may be so revealed. GolfShoesOnly.com employs standard industry measures to protect and ensure the confidentiality of your personally identifiable information, including the use of firewalls and SSL encryption. Despite these efforts, we cannot guarantee the security of your information given the current state of the Internet. We also do not undertake to maintain information about you for a duration greater than as provided by law, rule or regulation. We believe we employ security measures in a good faith effort to store the information our users provide in a secure operting environment that is not available to the public. You can review and modify (or remove) the information you provide us in the order or registration process if this information changes. The information that you may change (or remove) includes any information provided on our order or registration format. To make any of these changes, you may log on to this site and make the changes directly after you have received an identification and password for the transaction or for the individual order. After either completing your first purchase at GolfShoesOnly.com or otherwise using our registration module, your registration on our site will be confirmed by an email correspondence to your email address. If you do not object to such email within three days, it will constitute your consent to receive email notices and other email communications from GolfShoesOnly.com and its advertisers and promotional affiliates. In the event you no longer wish to receive such email notices or other email communications from us, you may opt-out by removing yourself through our opt-out procedures. You may also contact us at questions@GolfShoesOnly.com if you no longer wish to be enrolled as a User. © 2006-2019, Golf Shoes Only, LLC and Global Value Commerce, Inc. All Rights Reserved. All trademarks appearing in this site are the property of their respective companies.